When faced with difficulties in finding leasable space, Daiken-Met Architects took matters into their own hands by designing and building a temporary, moveable shipping container office. Sugoroku Office is built from seven 20' containers set within a steel frame system to reduce loads on the containers and create space for balconies. Located in Gifu, Japan, the temporary building provides space for the firm's office along with housing space and a storage system. As Daiken-Met Architects told us, “In the local city, we are facing various problems such as decreasing population, increasing vacant land, on the other hand it is difficult to make a rental contract for small buildings.” Because of this, they decided to build their own office and obtained a short-term rental contract for a small parcel of land where they could set up their temporary office. As part of their lease agreement, they proposed an architectural design and agreed to remove and reconstruct it every few years. 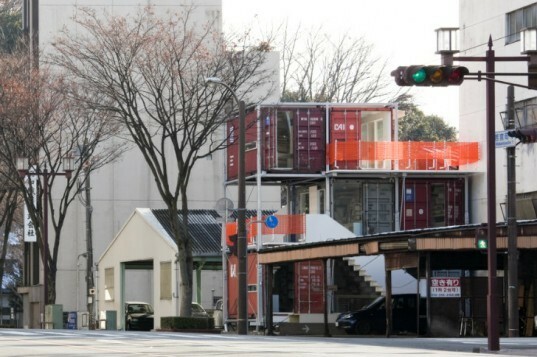 The Sugoroku Office is built from seven stacked shipping containers on three levels with two spaces left open for balconies. A mobile steel frame serves as the foundation – it provides support for the containers while reducing the structural load placed on them. Circulation routes are installed on the outside of the containers to provide access all the way up to the 3rd floor. The frame and containers can easily be dismantled, removed and rebuilt whenever necessary. The interiors of the containers are finished with used plywood or packing bands from a construction site. As Daiken-Met Architects told us, "In the local city, we are facing various problems such as decreasing population, increasing vacant land, on the other hand it is difficult to make a rental contract for small buildings." Because of this, they decided to build their own office and obtained a short-term rental contract for a small parcel of land where they could set up their temporary office. As part of their lease agreement, they proposed an architectural design and agreed to remove and reconstruct it every few years. 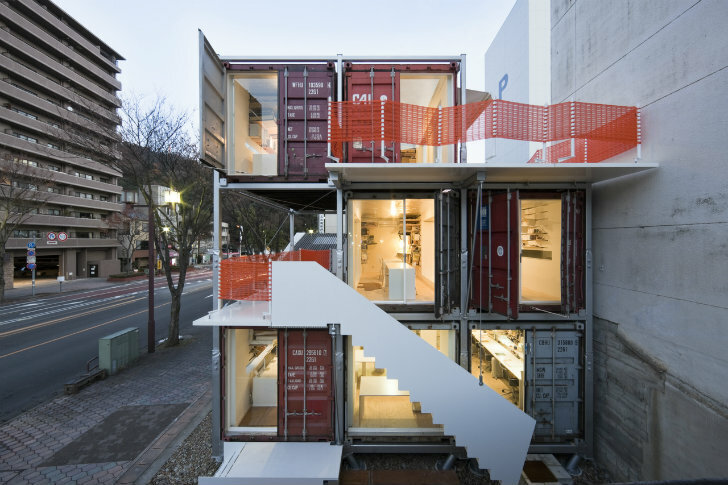 The Sugoroku Office is built from seven stacked shipping containers on three levels with two spaces left open for balconies. A mobile steel frame serves as the foundation - it provides support for the containers while reducing the structural load placed on them. Circulation routes are installed on the outside of the containers to provide access all the way up to the 3rd floor. The frame and containers can easily be dismantled, removed and rebuilt whenever necessary. The interiors of the containers are finished with used plywood or packing bands from a construction site. A covered porch leading into work spaces.